Bring a charming scene to new life on your roof or deck using the Whitehall Country Doctor Accent Weathervane. The bold topper adds a new touch to this traditional accent. A horse drawing a buggy shape captures attention, while a slight silhouette of a person inside the buggy completes the unit. Delicate spokes on the buggy wheels and an attentive pose on the horse further the theme. This scene rests on an 18" long arrow, which moves easily in a breeze to indicate wind direction. A 13.5" long, aluminum shaft supports the horizontal arrow, and connects to your roof or other surface with its versatile base. Fixed arms on the shaft indicate the four cardinal directions, and these arms may be properly oriented on the post for an accurate vane. The black color throughout this piece maintains its classic theme, while still offering a bit of detail. Crafted from durable aluminum, this topper is sure to look great for several seasons. 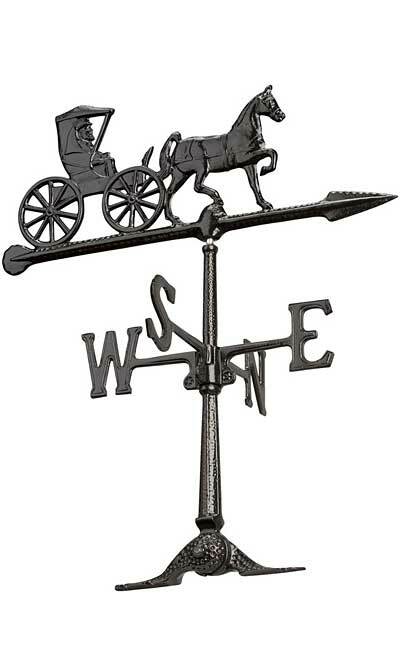 Monitor wind direction in a delightful new way with this Country Doctor Accent Weathervane. Assembly required. Made in the USA.